The editors were apparently facing serious challenges during the spring and summer of 1934. 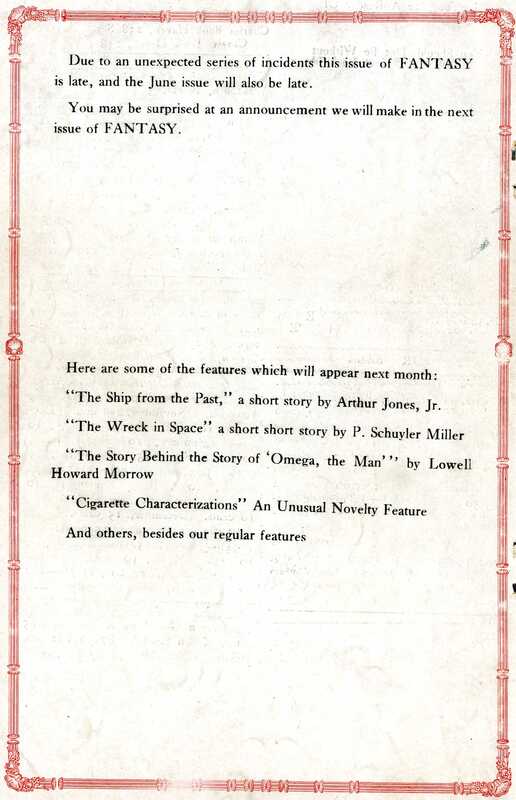 The May issue arrived late, and contained only the first half of the Cosmos chapter slated for the month. The problems were discussed in the June issue. Writer’s Digest says “the market for science fiction is wide open for the writer who knows how to write it. But unless you have majored in chemistry and physics, and know the trend of modern science fiction, you haven’t much chance, unless you get in touch with some professional scientist for criticism.” What have I been saying? Good science fiction authors are as scarce as hen’s teeth right now, because the depression chased most of them into ordinary fiction fields, and they, having lost contact with the recent rapid evolution of science fiction, have been unable and partly unwilling, to return. FM began to deliver on it promise to expand into “weird fiction” with the first appearance of H.P. Lovecraft. 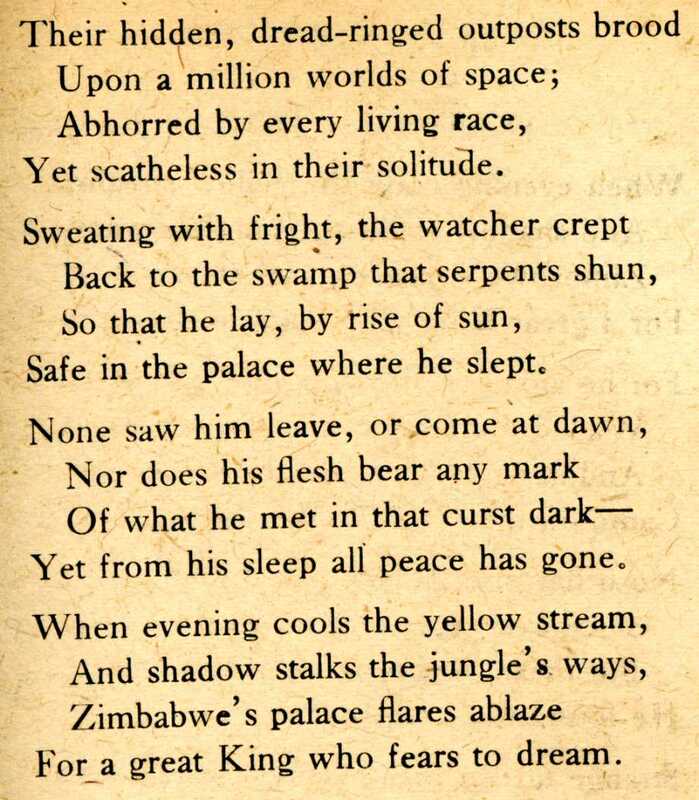 Lovecraft was becoming prominent at this time with frequent pieces in Weird Tales. “The Outpost” had first appeared in 1930 in an amateur press pamphlet called Bacon’s Essays, edited by his friend Victor A. Bacon. Much of the early work of Lovecraft and his contemporaries was first published through a close-knit network of amateur journals before appearing in professional venues. Most people know that fine tradition of the theatre, “The Show must go on.” The publishing industry has its fine tradition, for, despite all obstacles, the issue must go to press. A. Merrit, editor of The American Weekly, the Hearst syndicate magazine, in spite of his recent bereavement, difficulties with his own magazine, and a severe attack of laryngitis, got his part of COSMOS to me in time to be printed for our last issue. The finest tradition of our vocation was once again upheld. I think you’ve let yourself in for some arguments, Mr. Wollheim. “…COSMOS great. Carry on Solar System! If the present ‘crew’ of typesetters and proof readers were fired there wouldn’t be and FM. The entire printing crew, typesetters, proof readers, and press men happen to be compressed into one man – me… Joking aside, the task of printing FM each month is one that most printers wouldn’t take even with a salary. I have no linotype or high speed press which would make the job merely a matter of days. FM is set by hand, and takes the better part of each month to complete. 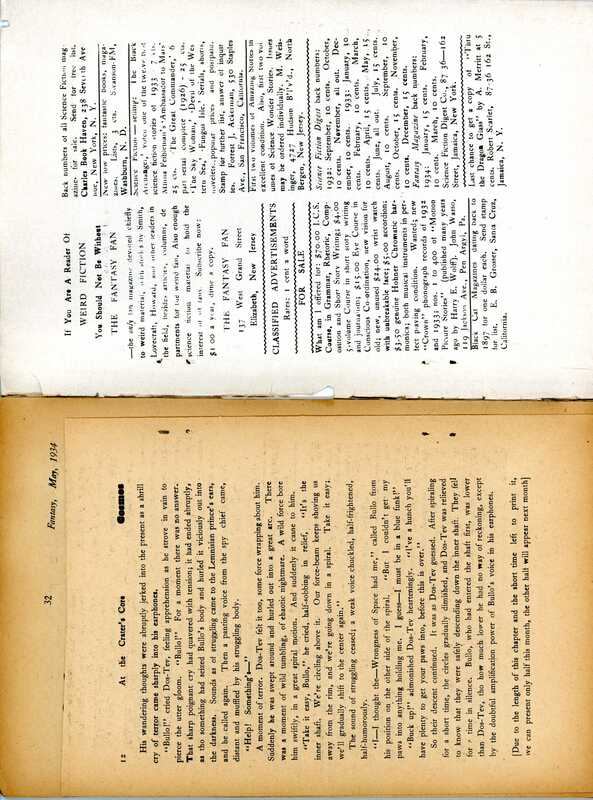 Read about the June, 1934 issue.